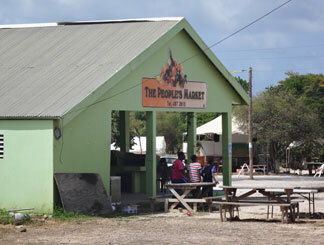 A delicate and memorable name, one I've heard and overhead often during my time in Anguilla. When I asked why that name kept being mentioned (after hearing it said for about the tenth time! 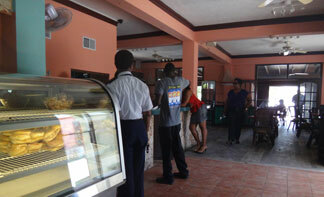 ), I learned it is a restaurant and a popular one, too, especially with locals. 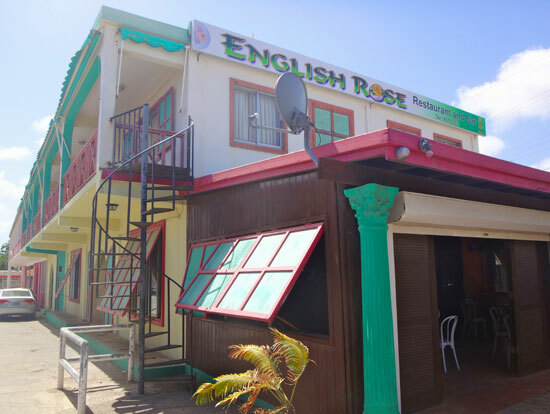 It was a nice Anguillian couple I met on an evening at an Anguilla election results gathering who sold me on a meal at English Rose. 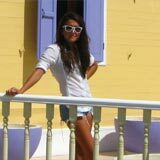 They were in Anguilla only for the election before returning back to their residence in England. Since it was very late and many hours since we'd eaten dinner our brief chat was mostly about food. 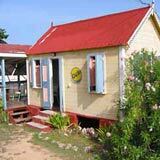 When asked where their must have meal was when visiting their island home of Anguilla, there was no hesitation. In unison they said, "English Rose" and recommended I try their fish. With my curiosity further piqued thanks to this couple, I stopped by late one afternoon and had a look inside. In the heart of The Valley, next to the People's Market and set back from the road, nearby Government buildings and businesses keep this spot busy come lunch hour during the week. 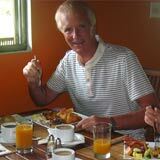 Inside, the dining area is clean and, though you feel that you're in the bustling Valley, it's not noisy. The paint color choices, dark wood shutters and double French doors are all nice design choices, too. 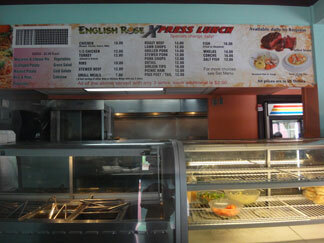 The first day I visited, I was too late for the hot food from the restaurant's express lunch counter. There were a fair amount of people inside even then, so I decided to return several weeks later and a little earlier this time, around 1:30pm. When I returned there was, once more, plenty of people around for late lunch. From the looks of the quantity of food left at the express counter, I was still too late to have a full selection to choose from but there was enough to satisfy my curiosity about English Rose. Note: Don't let the popularity deter you. They are clearly used to their volume and when I've asked around, people consider it to be average in speed of service. I decided to get some to take out, choosing the "Small Meal" for $7 US each. The small meal is a half order of ribs or chicken and comes with 2 sides. The macaroni and cheese pie was nearly finished, as was the coleslaw. I went with what was left, the rice and peas and vegetables, and the curry chicken wings for a friend and the ribs in BBQ sauce for me. Tip: For the best selection, go early! I should admit that I don't always find this type of food display to be appetizing but never could the display override my opinion of how it tastes. So if it was going to surprise me given I was getting the end-of-lunch options, I was open to find out. The lady handed me my two styrofoam containers. I carried them to the counter to pay and added an Arizona Green Tea to my order (they have a full variety of sodas and juices). My bill was $16 US. Once home, first I tasted the vegetables - a mix of steamed carrot slices, broccoli florets and zucchini half moons. The carrots were cooked perfectly. 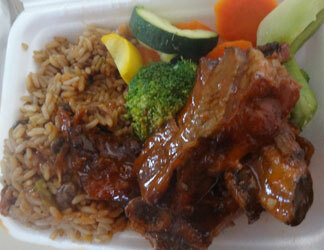 Next I tasted the rice and peas which had been topped with a small amount of the barbecue sauce from the ribs. Delicious and flavorful for rice and peas. Finally the ribs. It was a little disappointing to only see 4 ribs. Two of them were pretty large and the other two were average in size. The taste made up for the small portion size, though! My expectations of the last of the buffet of hot food being mediocre were shattered and my tastebuds were very happy. I started eating faster and faster and then I really wished I had more ribs… they were scrumptious. I was surprised and impressed. After I ate every single bite that was in my container I was perfectly fulfilled. The small meal had ended up being a fine amount for lunch. A fifth rib might have made it a little better but I was 99% satisfied. I sampled my friend's curry chicken wings and they were also full of flavor. Both meals will be repeats and now I'm even more curious to try the rest of the menu. 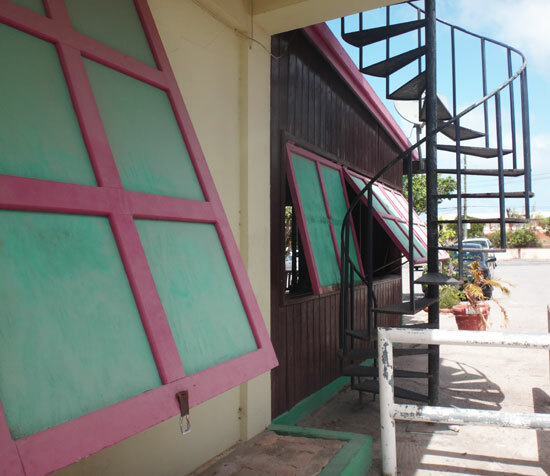 While I was in English Rose that day, I saw a large fish plate and 1/2 chicken plate go by and they naturally looked even better than the buffet food. I can only imagine that these fresh out of the kitchen plates must be why that couple responded the way they did. Now it all makes sense… The steady mentioning of the name "English Rose" over the years and the depletion of the lunch express section well before 2pm - it's because the food is really good. I'll be back and likely soon! The menu is listed in US dollars and the entrees except for the small meals come with 3 sides. Additional sides are $2. 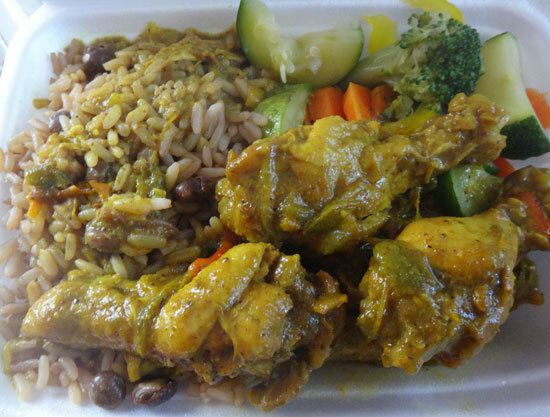 There's chicken: BBQ, baked, curried or stewed for $10. There's even a 1/2 of a chicken or 1/2 turkey, stewed or baked for $12. A full order of ribs is $10. More mains… Roast Beef, Lamb Chops, Grilled Pork, Stewed Pork, Pork Chops, Oxtail, Sirloin Tips, Picnic Ham, Pigs Feet/Tail, Fish (Fried or Steamed), Whelks, Conchs and Salt Fish. 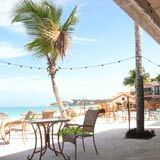 The mains start at $12 and the priciest is the Whelks for $18, followed by the Fish, Sirloin Tips and Conchs for $16. Hours: English Rose is open daily (except Sunday) 12-3pm for lunch and 3-9:30pm for dinner. 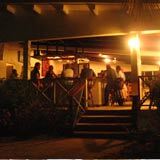 It is also known to be a popular spot for Friday night karaoke too!